Take a nice long look at those two handsome vehicles up there. They have that clean, square-jawed look of an early Range Rover, don’t they? They look like rational, practical examples of mid-late ‘70s truck and SUV design. There’s something very surprising about them, though. Think you know what it is? Well, to be a bit more accurate, they’re both built on a standard Volkswagen Type I, rear-engined chassis. In this case, that chassis was built by Volkswagen of South Africa, as some experimental prototypes to try out some new body design and materials ideas for future, VW aircooled-based cars and trucks. As someone who actively and obsessively seeks out obscure VW prototypes and strange stillborn concepts, every time I encounter something new, I’m filled with awe and wonder at the vastness of the world that’s still unknown to me. It’s humbling, and I relish that shaky feeling of wonder and disbelief that happens whenever I encounter some forgotten VW prototype I never knew before. And these right here, these astoundingly un-Beetle-like rugged vehicles, these are a wonderful dose of this glorious madness. • First, I can tell they’re South African because of the little white reflectors under the indicators on the bumper. Those were required on all South African cars up until around the early 1990s. • The fuel filler location on the front fender suggests a front-mounted gas tank, something unusual for a car with a front-mounted engine. • The little air-intake vents on the sides of both cars and the larger air scoop on the D-pillar of the SUV also hint at an unexpected engine location. • Those awesome wheels were also used on the South African VW 1600 S and the Fun Bug and other Beetles. • If you look carefully, you can barely make out details of the VW chassis and the front torsion tube suspension. I haven’t been able to find out anything about these cars anywhere else on the Internet, at least not yet. 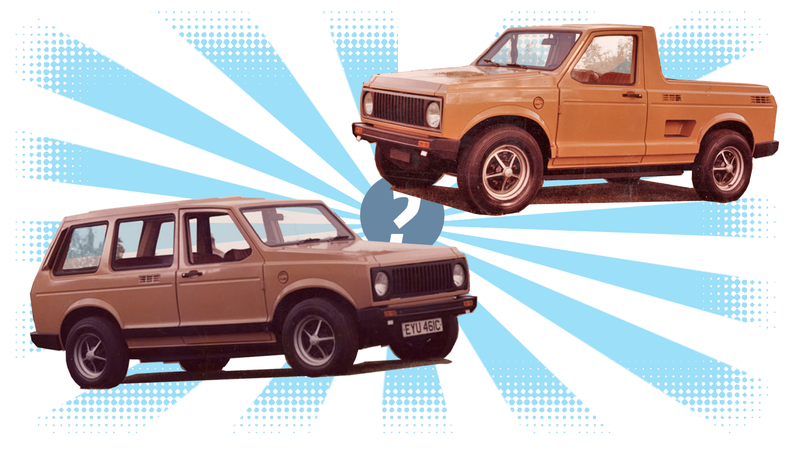 They seem to have bodies made from plastic and fiberglass, which sort of makes them like South African versions of the Gurgel cars, which put SUV and truck plastic bodies on standard VW chassis. Since these are the only pictures of these I’ve seen, I’m going to try and guess the interior layout of these myself. The boxy, tall bodies should offer plenty of interior room, and the trunk volume should be pretty decent. The tall ride-height also makes me wonder if maybe these were using the portal axles and raised suspension from the Type II buses or the Type 181/VW Thing? That trunk would also be remarkably well-ventilated, if those front grilles do anything at all. Maybe they feed the fresh-air ventilation system, like the front grilles on a Karmann-Ghia? The height of the bodies should help keep good rear cargo room despite the tall profile of the Beetle’s upright-fan air-cooled engines. VW had lower-profile engines for the Types III and IV, but I don’t think those were built in VW’s South African branch. At best, they may have used the side-mounted air cleaner from the Bus to save a few extra inches in height. As you can see, the tall VW engine would have made high load floors and truck beds, but the extra space offered by the front trunk would have offset that pretty well. 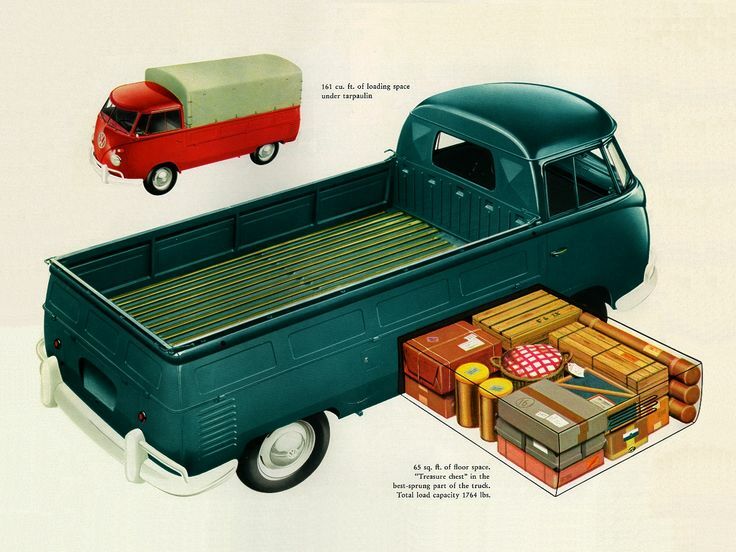 In the case of the pickup, an under-bed storage locker could have been added, in the same way that Volkswagen did with their design of the Type II single-cab pickup. As of now, I have no idea what happened to these amazing vehicles, but I’m looking into it, and will see what else I can find out. The pair of these are incredible refugees from a future that never happened, one where maybe clever body design could have carried the old, ‘30s era Beetle platform into strange new places. Places that look a lot like early Range Rovers. UPDATE: Thanks to reader Oliver Guin, I now know this was referred to as Project 1021, and here are some more pics!